In recent years, Paddy Field Dams have received recognition as a measure to alleviate flooding due to torrential rains. Paddy Field Dams have been in practice in several prefectures of Japan, namely Niigata, Hyogo, and Nara Prefectures. Various issues have come to attention when introducing Paddy Field Dams to rural communities, such as the discrepancy in valuation between beneficiaries (downstream communities of paddy fields) and practitioners (farmers and irrigation administrators), the framework for supporting farmers in their installation, operation and maintenance, and identification of strategic locations in the context of river basin management. 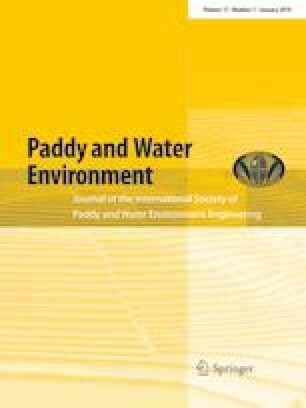 The purpose of this study was to clarify perceptions and valuations of Paddy Field Dam functions by rural communities in Nara Prefecture, Japan, under the above-mentioned issues. Analysis was performed using the results of a questionnaire survey conducted in three districts of Nara Prefecture. In addition, a Contingent Valuation Method (CVM) was applied to estimate the economic value of a Paddy Field Dam. The results indicated that awareness of Paddy Field Dams was lower than expected. However, it was found that many respondents value their practice and expect them to reduce the risk of flood damage effectively. In addition, the results of the CVM analysis showed that the annual willingness to pay (WTP) per household was estimated at a median value of 2200 yen to 3000 yen, with an average value of 3600 yen to 5600 yen. The WTP tended to be higher for districts that had experienced flooding in the past. This study was carried out as part of research on the use of paddy storage functions supported by Nara Prefecture in 2017.